This year’s NASW National Conference, entitled “Social Work: Courage, Hope & Leadership,” dazzled once again with another roster of dynamic keynote speakers, individual presentations, and educational symposia. On Wednesday, July 23, following opening remarks by NASW CEO Angelo McClain, PhD, LICSW, and President-elect Darrell P. Wheeler, PhD, MPH, ACSW, the audience was treated to an energetic performance by nationally recognized spoken-word poet Kane “Novokane” Smego, whose workshops explore the power of voice and stories as tools for self-transformation, nonviolent resistance, and community engagement. Smego was a hard act to follow but Brene Brown, PhD, LMSW, the high priestess of inspiring presentations so intimate you think she has looked into your journal and is talking only to you, did not disappoint. Brown is a scholar, professor at the University of Houston School of Social Work, public speaker, and author of two No. 1 New York Times bestsellers, and has spent the past 12 years studying vulnerability, courage, worthiness, and shame. I recall the first time I heard her speak when I listened to the now-famous TEDTalk on YouTube about vulnerability that has since garnered millions of hits. Like many, I thought she had somehow eavesdropped on my therapy sessions, learned my innermost thoughts and fears, and had found a way to make her message so real, tender, and intimate that it brought tears and a recognition that she had been where I had been, where we all have been, and that she truly knew what vulnerability felt like and was not afraid to speak that truth. Brown’s session was another opportunity for her to inspire and infuse audiences with what she describes as the ability to “dare greatly,” to move with and through shame and discomfort to courage and success. Attending a conference so rich in educational opportunities always presents the dilemma of which sessions to choose, as one cannot be in two or four places at once. On Thursday, July 24, the Plenary Session on “The Interface of Ethics and Technology” presented by Frederic Reamer, PhD, a professor in the graduate program of the School of Social Work at Rhode Island College and editorial advisor to Social Work Today, was a highlight of the conference. Reamer tackled the behemoth of the ethical challenges presented by the growing use of digital technology in social work practice. Reamer offered a summary of social work in the digital world and explored the unprecedented ethical issues raised by these new methods of communication. While he had 11/2 hours to do so and did an excellent job, I’m sure there was much more material than what he was able to cover in that time slot, but kudos for a comprehensive overview. According to the press release, earlier in the year NASW announced winners of the 2014 Media Awards. The recipients include documentary filmmakers, television producers, bloggers, newspaper reporters, columnists, and other media professionals who helped spotlight social work services and critical social issues in 2013. Social workers and the public nominated newspaper articles, newspaper columns, magazines and/or magazine stories, websites, blogs, radio segments, television news programs, fictional television programs, reality television programs, commercial films, and documentaries for the awards program. 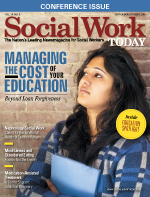 More than 1,350 people visited the website socialworkersspeak.org, an NASW site that tracks how social workers are portrayed in the media, to cast their votes for 47 nominees. Social Work Today is a proud recipient of the 2014 Media Award for Best Trade Publication, and I was honored to accept the award from Dr. McClain at the conference. That was truly one of the personal highlights for me from yet another stellar NASW conference. — Marianne Mallon is editor of Social Work Today magazine.